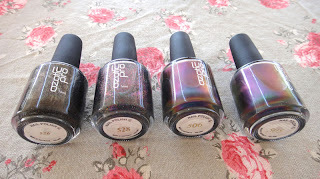 Today I want to share with you a very special nail polish brand from Australia, Ozotic Pro. 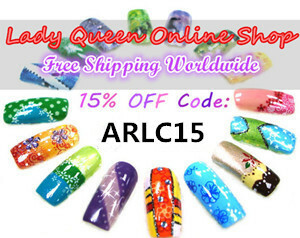 Ever since my dear 'Chelle sent me my first Ozotic Pro nail polish I fell in love with this brand. 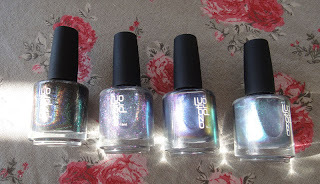 Recently I found out it could be pruchased internationally via Picture Polish so I decided it was time for a mini haul. 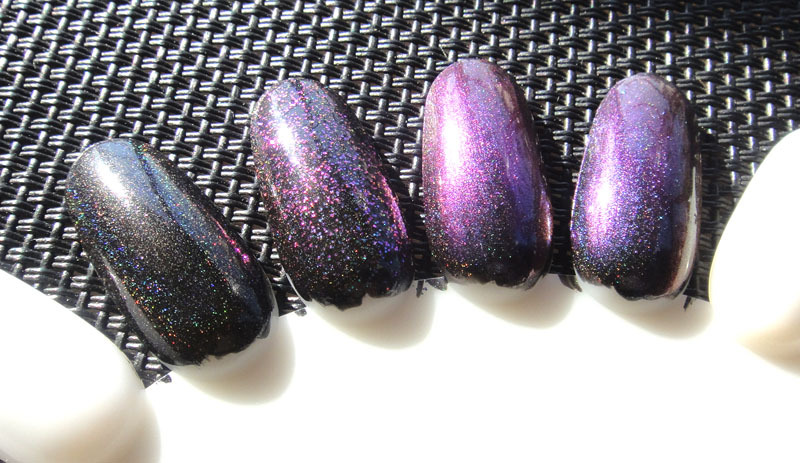 After careful consideration I decided on Galaxy, Elytra 528, Eclipse and Reef (as seen from left to right). No photo can really capture the beauty of these nail polishes but I tried my best. 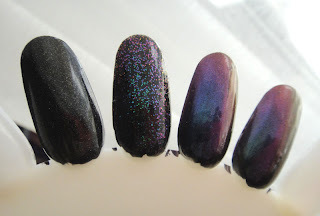 I did a few swatches on a nail wheel under direct sunlight. 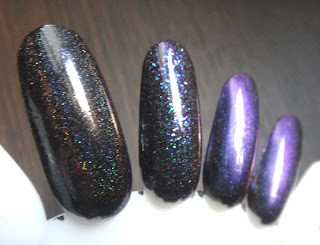 Galaxy, which is a black holo, is two coats, while the other colours are layered over a coat of Galaxy. No topcoat was used. The colours from left to right are as mentioned above. What do you think? 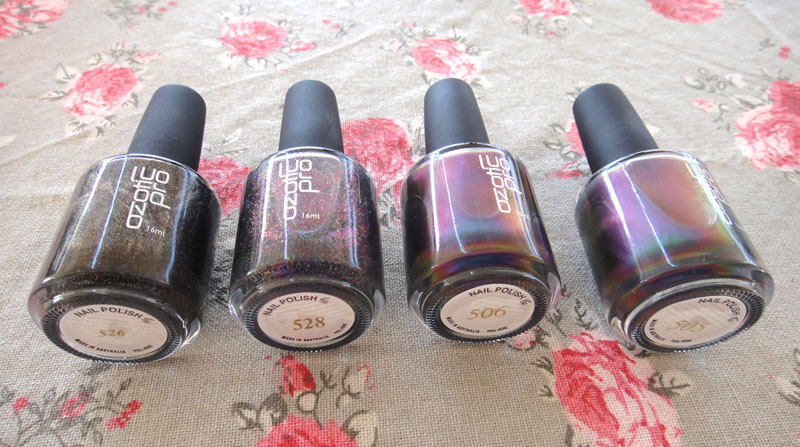 Do you own any Ozotic pro nail polishes? never heard of the brand before but might look into them now. How much is pricey? Worth the money though I bet! Truly beautiful colours! 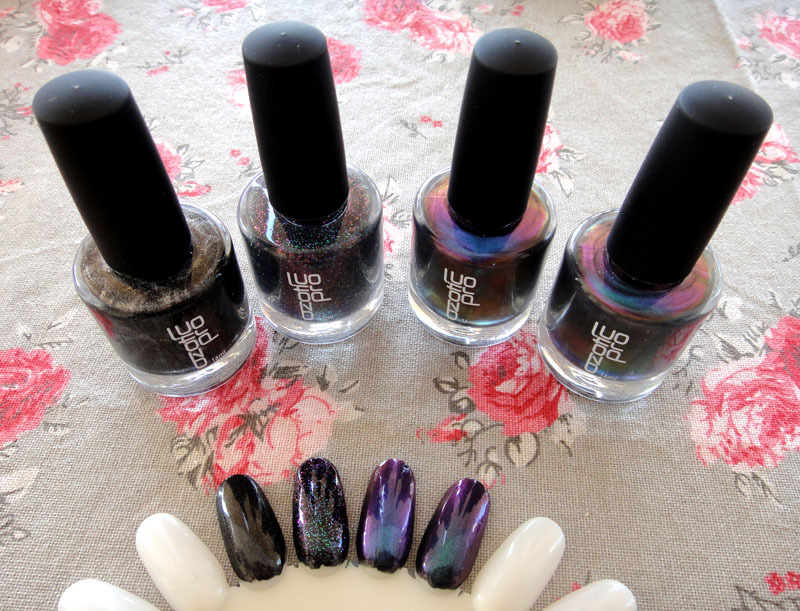 Can't wait to see your mani's with these beauties! interesting to see you can get parcel from australia because i am scared with all those liquid bans..
@Lacquertopia they are at 14.95 Australian Dollars, so definitely pricey. But well worth it, believe me. The photos don't do them justice. @λειντι ντι this brand is apparently quite hard to find. If it wasn't for my dear friend from Australia I wouldn't have heard of it either. The holos are really impressive but the really amazing ones are the multichromes. 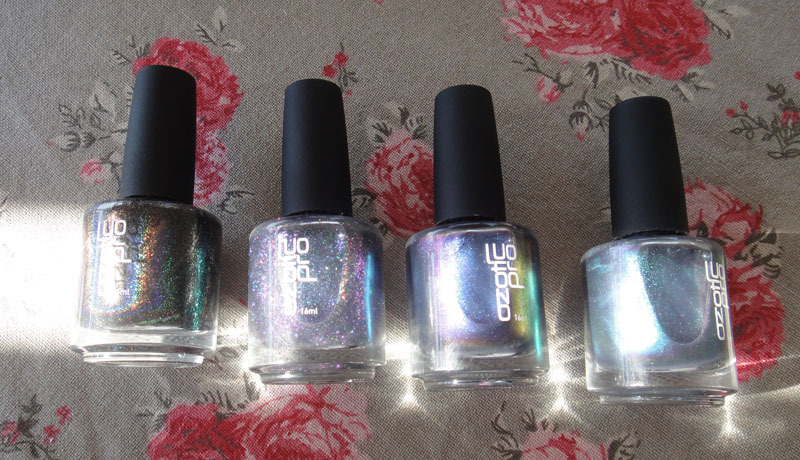 I never expected a nail polish being able to change so many colours! Quality wise they are excellent. I never had any problems with parcels from Australia so far. I guess sellers have a special permit. Beautiful Colors deary... Love them!!! You are soo lucky!! Those shade are absolutely gorgeous!!! Aww you always find new brands to share! !these all look so gorgeous hun!! I really have to try these polishes! Ooooh these are pretty! I like how they shine differently under different lighting. So nice! I was fortunate to swatch for a couple of these but really need to buy more. I think I can hear the angels sing when I saw the pictures. Thank you everyone ^_^ If I could, I would get the whole range, all the colours are fantastic!